New Chapte Every Woman's One Daily 40 Plus is a whole-food complexed multivitamin for breast, hormone and digestion health. New Chapter Every Woman's One Daily 40+ is probiotic and whole. New Chapter Every Woman's One Daily 40+ is formulated specifically for the needs of active women over forty. New Chapter Every Woman's One Daily 40+ is more than a food supplement, it's supplemental food. Woman's multivitamin fermented with beneficial probiotics and whole foods. Convenient one a day multivitamin, gentle enough to take anytime, even on an empty stomach! Made with Certified Organic Vegetables & Herbs, Non-GMO, Project Verified, Vegetarian, Kosher, Gluten Free, No Synthetic Fillers, No Animal Gelatin (added to some gummy vitamins). 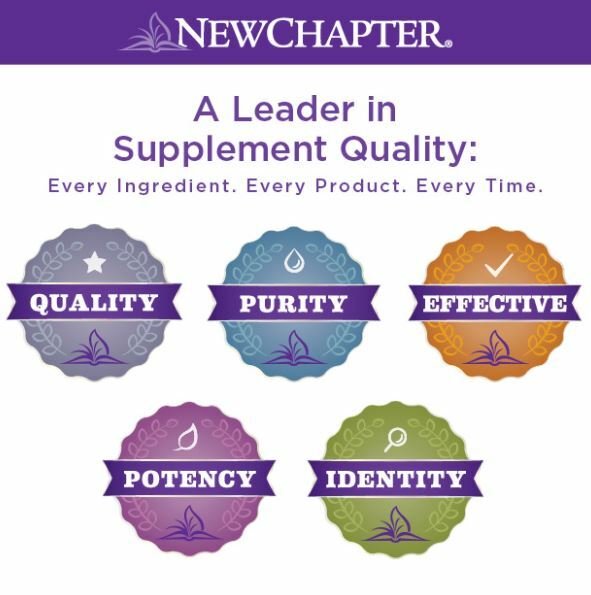 New Chapter takes a sustainable, whole-food approach to vitamins and supplements that deliver industry-leading standards of quality: Every ingredient. Every product. Every time. From concept to bottle, our products are responsibly sourced, expertly formulated, and meticulously manufactured. New Chapter tests for purity, potency and identity with independent third-party labs. Their certified organic and Non-GMO Project Verified products go through a detailed credentialing process, and their ingredients are sustainably sourced organic Turmeric from India, wild-caught Salmon from the clean waters of Alaska, Red Marine Algae from Iceland's pristine coastline. New Chapter believe's the best way to deliver the healing Wisdom of Nature is through safe, effective, and high quality products made with Earth's pure ingredients. New Chapter's industry-leading quality process ensures you are getting exactly what is listed. Suggested Use: One tablet daily. Can be taken on an empty stomach. † Nutrients and herbs are cultured in organic media that may contain: organic milled soy, Saccharomyces cerevisiae (organic yeast: active and inactive), organic maltodextrin, organic gum acacia, organic orange and lemon peel, organic carrot powder, organic alfalfa powder, Lactobacilli (L. acidophilus, L. bifidus, L. rhamnosus ) and enzymes (deactivated). Caution: As with dietary or herbal supplement, you should advise your healthcare practicioner of the use of this product. If you are nursing, pregnant, or considering pregnancy, you should consult your healthcare practicioner prior to using this product.